I've been dying to wear these custom Nike Roshe sneakers for a blog post ever since I got them last winter so what better time than eight months after I got them?! 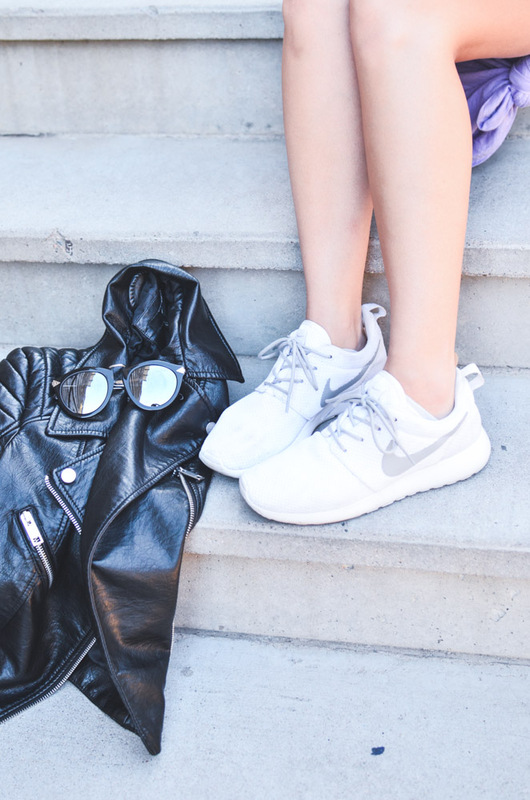 ;) I think sneakers can totally create a different vibe for outfits that involve basic pieces like a simple t-shirt dress and leather jacket. They're kind of an unexpected choice to wear with a dress, but I like that. The finishing touch on this look are my absolute favorite sunglasses. These mirrored lensed Karen Walker sunglasses are literal perfection and if you follow me on snapchat, you probably heard me squealing like a five-year-old child when I opened the box they came in. DITTO is my newest obsession because you get access to designer sunglasses whenever you want them. It's kind of the best because if you're anything like me, you get tired of your old sunglasses and want new ones. I'm constantly frothing at the mouth over designer sunglasses and now we can actually afford them. Luckily for you, DITTO is offering my readers one month FREE when you use the code GOLDENSWANK so you can try out these Karen Walkers too. You can cancel your membership at any time, but let's be honest, you probably won't want to. i love this look. you are beautiful! How perfect is your style!! I really love this outfit, you look amazing with the sunglasses, everything goals!! Love love love what you did here. Perfect styled, Jess. Love the knot at the end of the dress. Adding those little details make all the difference in the world. Love that jacket, I can't believe it's from Forever 21. Great style! good on your laptop or computer with portable program. snapchat update This will be useful when you didn't have enough time to use this app on online nice. good it provides out a excessive top quality and Great definition ak 47 kodi Kodi for Mac Personal computer that situation is definitely nice.